In April 2015, small-scale Bolivian farmers who painstakingly work the land as their ancestors did – clearing small plots, planting and waiting for rain – gathered for a summit with stakeholders from a very different part of the agricultural sector: commercial farmers who oversee vast farms and watch international exchange markets just as closely as the weather. They met in the Amazonian city of Santa Cruz: commercial growers, communal landowners, environmental advocates, indigenous groups, members of agricultural cooperatives, people living in protected territories, politicians, and big business. All advocated passionately for their intertwined and divergent visions for the future of agriculture. Such exchanges between the historically marginalized and the powerful are characteristic of the new Bolivia under Evo Morales – the first indigenous president to rule a majority indigenous country. He took power in 2006 and oversaw a constitutional overhaul in 2009 that introduced major reforms benefiting many of Bolivia’s peasants and indigenous communities. At the agricultural summit, peasant women in traditional black bowler hats rubbed shoulders with some of the richest landowners in the nation. They gathered around five different tables to engage in sharp debates about land occupation, GMOs, and land use. Their input was heard in the run up to a government and agricultural producers’ re-launch of the agricultural sector for the state of Santa Cruz – the nation’s largest in land area, and the region most affected by deforestation. Noticeably absent from the summit were environmental NGOs and some indigenous groups that have lost favor with Morales for their opposition to his policies. In the end, the agricultural producers agreed to several proposals. Although the measures are not legally binding, Bolivian media reported that technical teams from the Bolivian government and the Eastern Agricultural Chamber have already met to draft laws based on the proposals. Central questions emerged at the summit: Will new agricultural initiatives come at the expense of rainforests, crop diversity and the promotion of small-scale agriculture? 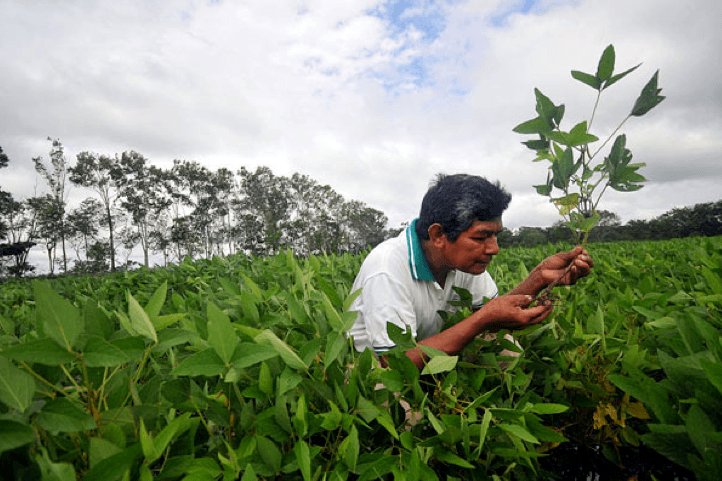 Will genetically modified crops – widely opposed by indigenous people and nearly banned in the 2009 constitution – find acceptance in Bolivia? And did the stakeholders invited to the table fully and fairly represent the entire Bolivian agricultural sector, which consists of an uncommonly diverse mix of more than 30 ethnic groups, nurturing everything from coca to quinoa, and alpaca to cattle, across landscapes that stretch from the high Andean plains to lowland jungle basins? Carlos Romero a senator from President Evo Morales’s ruling party, the Movement Toward Socialism (MAS), set the overall theme for the summit: “The expansion of the agricultural frontier newly plays a fundamental role in development,” he told reporters, clearly defining “development” here to mean the extension of agricultural lands into the natural landscape. Bolivian women farm the land wearing the traditional dress of indigenous and peasant people of the highlands. Photo credit: Elias Quispe under a Creative Commons Attribution-Share Alike 3.0 Unported license. However, in a country where government proposals for agricultural expansion far exceed available, cultivable land, it is unclear how the state’s agricultural development goal will be achieved without cutting down Amazon rainforest. Small-scale farmers at the summit won support for a proposal to expand the limits on the amount of land small producers are allowed to deforest, from 5 to 20 hectares (12 to 49 acres). 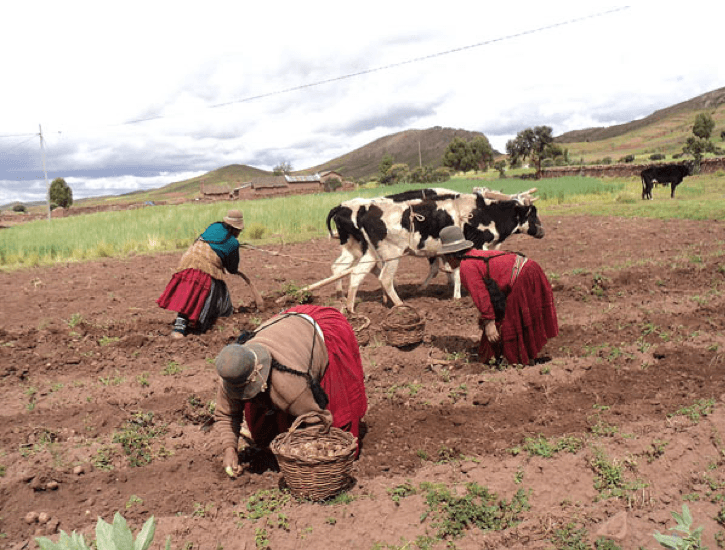 Although this change could increase productivity for some of Bolivia’s poor and middle class farmers, it could also have drastic environmental impacts. Lorenzo Solís, director of the Center for Investigation and Promotion of the Farmworker (CIPCA), estimated that this measure alone could lead to the deforestation of about 2.5 million hectares (6.2 million acres), as reported in the Bolivian newspaper La Razón. Large landholders achieved a goal at the summit that could help better secure their properties. Under current Bolivian law, landholders have two years to prove that their land is not lying fallow, or it can be confiscated and redistributed by the state. That period was extended to five years under summit proposals to allow for bureaucratic hurdles and improve investment potential. Critics worry that this extension might create more speculation, a greater demand for land, and more deforestation. The rewrite of the Bolivian Constitution in 2009, engineered by the Morales administration, nearly banned GMOs outright. The first draft of the constitution, written by diverse indigenous and peasant groups, proposed an article unequivocally banning the “production, importation, and commercialization of GMOs.” However, the government and opposition groups arrived at a last minute deal to soften the article and allow for GMOs to be regulated under law. The Morales administration and allied indigenous and peasant groups have often spoken out in opposition to GMOs since then, with criticism at times veering into the realm of the absurd. Morales derailed a 2010 environmental summit by blaming homosexuality on genetically modified chicken. 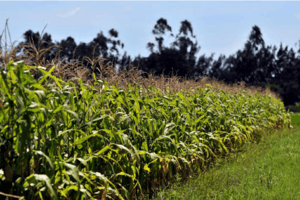 Peasant groups worry that GMO introduction would put them at a competitive disadvantage, as only wealthy landowners would be able to afford expensive GMO seed. Several Bolivian laws, including the Law of Mother Earth and the 2009 Constitution, continue to ban GMOs for crops not native to the country. In contrast, 100 percent of soy, a non-native crop, is genetically modified in Bolivia. After days of dialogue, disagreement and compromise, the summit ended in an impasse over the controversial topic. Ultimately, the anti-GMO camp claimed a small win: the Pact of Unity, a collection of small farmer organizations and indigenous groups present at the summit stonewalled a proposal for the introduction of GMOs in sugar, cotton, corn and other crops. Whether or not this win will prevent new legislation allowing for GMOs, however, remains to be seen. A few days after the summit, the vice president refused to comment on the administration’s position, instead saying that he hoped producers would come to an agreement. Internationally, President Morales is known for championing environmentalism. He has accused certain countries of committing “ecocide” against “Mother Earth,” who was granted the status of an individual with her own life and rights under a 2012 Bolivian law. Citizens are even allowed to sue on behalf of (and as part of) Mother Earth. Such measures have done little to stop environmental degradation in Bolivia, and Morales’s record on the issue is mixed. The country loses between 200,000 and 300,000 hectares (between 772 and 1,158 square miles) of forest each year, a loss that jeopardizes endangered species like the giant otter (Pteronura brasiliensis), spectacled bear (remarctos ornatus) and jaguar (panthera onca), and threatens fragile ecosystems, such as the Chiquitano Dry Forests, one of the most biodiverse dry habitat forests on Earth, and the Gran Chaco, home to hundreds of bird species. 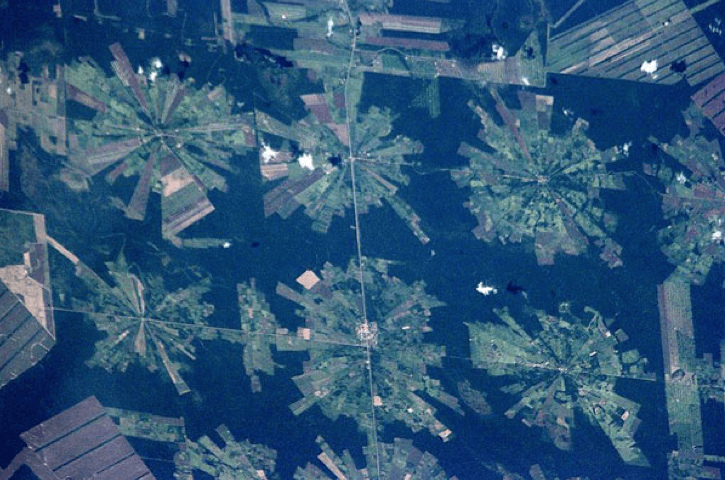 The loss of Bolivian forest also has implications for climate change. Seventy-seven percent of Bolivia’s carbon emissions come from the conversion of forests into agricultural land, according to a study released by the Bolivian NGO, Friends of Nature. Who doesn’t have a place at the table? The indigenous and peasant groups who did attend were part of the Pact of Unity, an alliance formed in 2004 between indigenous people and peasant farmers. It was this alliance that vigorously fought for reform in the early days of the Morales administration. In an interview in his countryside home, Rafael Puente, a Bolivian historian and the former governor of the Bolivian state of Cochabamba, emphasized the central role these organizations played early on under the Morales government, calling the Pact of Unity “The decisive, important social organization” in creating Bolivia’s new constitution. The Pact of Unity today, however, is a shadow of what it was five years ago. Tensions within its organizations – often radiating from disagreement over how closely to align with the Morales government – have left many of the groups splintered, with parallel, conflicting leaderships. “CIDOB doesn’t exist as such,” said Land Foundation director Colque, referring to one of the largest Pact of Unity indigenous organizations. “The national government has taken it upon themselves to create a parallel organization and eliminate the one that existed before.” He explained that peasant and indigenous organizations are weak and fractured due to internal divisions sometimes intensified by government intervention. He also raised questions about the ability of indigenous leaders to advocate for the interests of the people they represent. In an interview, Senator Romero, from the ruling party, denied that the government has interfered directly in indigenous organizations and argued that the divisions reflected internal tensions in highly diverse groups. Vos said that his criticisms were not meant as an attack on the government, which has worked closely on rural development projects with his organization. He pointed out in an email that, in terms of environmental stewardship, the opposition parties to the government had a “similar proposal… or worse” for agricultural development. The most glaring absence in the summit, however, was that of Mother Earth herself. Marco Ribera Arismendi, the National Research Coordinator in the Bolivian NGO Environmental Defense League, said that environmental groups had no voice at the conference. His organization – one of the most prominent environmental NGOs in Bolivia – was not invited to take part, nor did he know of any other environmental NGOs that were invited. Representatives from the government’s Ministry of the Environment were present, however. 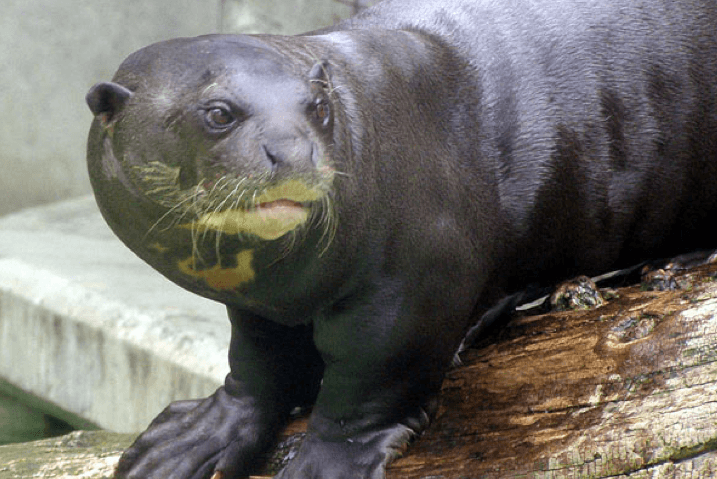 The Giant Otter (Pteronura brasiliensis) is one of the species threatened by deforestation caused by the expansion of agriculture in Bolivia. The ruling party has enough power to push through its agenda at the national level. Morales won the October 2014 election in a landslide, with over two-thirds of the vote. Even after losses in regional elections last March, his party still commands the political arena, and will likely do so for the foreseeable future. The question now is how the government will proceed. The post-summit decisions, if drafted into legal proposals by government officials, could shape Bolivia’s agricultural, environmental and political landscape for years to come. The administration hopes to massively increase agricultural production to cushion the blow of declining mineral and oil prices. But any expansion of farming will almost certainly mean degrading Bolivia’s environment, especially its forests. Those promoting a vigorous agricultural development agenda (including some small-scale indigenous farmers and especially large scale landowners) will likely come up against the resistance of vigorous defenders of the environment – ranging from native Bolivians to international NGOs. “We want the agricultural GDP in 2020 to be more than $10,000 million at minimum,” Morales said in a summit speech. “In order to do this, what do we need to do? If we must change laws, we must change laws; if we must modify decrees; we must modify decrees; if we must expand the agricultural frontier; we must expand the agricultural frontier; if we must improve technology; we must implement technology for the small, medium, and large producer, for associations and cooperatives.” – Where that leaves Mother Nature, Bolivia’s environment, its rainforests, or the giant otter is anyone’s guess.